The Roseville Visitors Association works directly with meeting planners to accomplish the final goal: the perfect meeting. Receive your free Roseville Meeting Planners Guide by downloading it or for more information, and to get a guide mailed to you, call/email Shannon Thomasser at the Roseville Visitors Association at (877) 980-3002. Rose Vine Hall offers professional and experienced staff to take care of you and your guests to ensure that your event is a smashing success. Our private spaces are designed to provide an inviting, casual atmosphere for any occasion. Drop down 130″ presentation screen with easy laptop hook-up, Plasma TV, DVD player, wireless microphone, 38 speaker sound system and high speed wireless Internet. Drop down 130″ presentation screen with easy laptop hook-up, DVD player, 16 speaker sound system and high speed wireless Internet. 2 Plasma Screen TV’s, wireless Internet and overlooks the main bar area and stage. Plasma Screen TV, wireless Internet and overlooks the main bar area and stage. The Roseville Skating Center’s banquet and conference space is like no other. The main banquet room can be divided into two rooms, which can be rented individually (Rose and Fireside), or combined (Olympic banquet room) for larger groups. The space is capable of accommodating up to 300 seated or 600 in non-seated reception style. Each room has a spectacular view of the outdoor OVAL. Roseville Skating Center is conveniently located just minutes from Minneapolis and St. Paul and offers ample off-street parking. Open catering policy. Free WiFi Available. Plenty of Free Parking. Bent Brewstillery offers unique meeting space and is “not your average office party”. The only Brewery and Distillery in the Twin Cities is double the fun! Recently named Star Tribune’s “Best of Minnesota” in 2014, Bent Brewstillery offers a new place to hold unique events and meetings. It’s not just a room with a view, it’s an experience of the senses. Bent Brewstillery can accommodate up to 115 people in the tap room. The interpretive building has been remodeled in 2015 featuring a tree sculpture tree in the main level. The building includes upper and lower level spaces and a full kitchen on each level. Whatever your facility needs may be, the Harriet Alexander Nature Center can meet them in a relaxed, natural setting. Two meetings rooms are available at the Ramsey County Library in Roseville for groups to come together, learn and exchange information and ideas. The library strives to make spaces available to groups on a fair and equitable basis. Community rooms are made available regardless of the beliefs or affiliations of individuals or groups requesting their use. Roseville City Hall offers a total of nine meeting rooms that can accommodate 60 people or less. The City of Roseville is home to a variety of community facilities available to host meetings, social gatherings and celebrations. The parks in Roseville can accommodate events year-round and facilitate a range of set-up option sand seating arrangements for up to 100 guests. Discover the six new park buildings which feature fireplaces, kitchenettes, convenient parking and picturesque views. Have an event outdoors at one of the four Central Park picnic shelters. For golf lovers, try Cedarholm Golf Course clubhouse, ideal for casual gatherings and active celebrations. The Country Inn & Suites Roseville welcomes all small gatherings of up to 40 guests, such as corporate training sessions, baby showers, family reunions, interviews and at-home business networking events. Prepare a presentation and use the large, wall-mounted TV with laptop connectivity and the free high-speed Internet access. A variety of room layouts are available to accommodate your group, and off-site catering options can be arranged. Make your next meeting a special event by surround your travelers with personal service in a convenient venue. Contemporary and flexible meeting rooms feature spectacular views and access to the outdoor Courtyard. The Courtyard by Marriott offers a unique option for receptions, dinner and group gatherings. Outdoor event space and full-service catering is also provided on-site. Allow our team to help plan your next meeting, party or event. All meeting rooms feature: projection screen, dry erase board, high speed internet access and bright, recessed lighting. Audio/Visual equipment available for rent. Professional on-site catering and banquet staff. Complimentary parking for all guests. The Holiday Inn Express meeting room is 500 sq ft and can accommodate up to 35 guests, theater style, and is ideal for intimate client meetings and group gatherings. White boards and some audio/video equipment are available to ensure your Roseville events are successful. Meeting room includes complimentary pens, ice water and glasses. 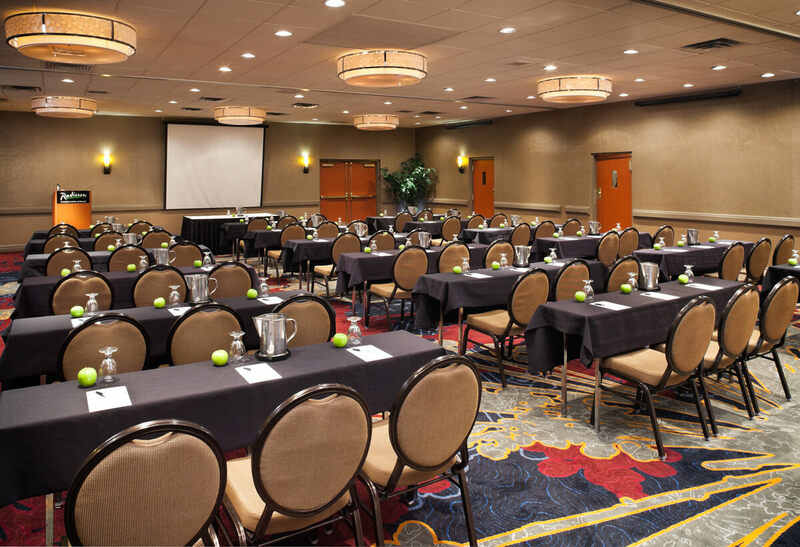 Featuring 8,000 total square feet of flexible meeting space that includes a grand ballroom, boardrooms and salons, our hotel is ideal for events in Roseville. The Emerald Ridge Ballroom, located near the main lobby, can hold up to 420 attendees, and a variety of more intimate events can be accommodated in our smaller breakout rooms. Each room features sophisticated climate controls, lighting, acoustics and electronics for audio-visual needs. Full Food & Beverage Menu available. The Minnesota State Fairgrounds offer a unique setting unlike any other event venue in the Twin Cities. With more than 15 buildings available to rent and 320 acres of versatile land, the fairgrounds are an ideal site for meetings, receptions, trade shows and conferences. The fairgrounds can accommodate both small and large events with building sizes that range from 10,000 to 60,000 square feet. A variety of catering and concession options are available along with equipment rental and free parking for all event attendees. Save time and money without sacrificing service at the Continuing Education and Conference Center. The center is a full service conference facility located on the Saint Paul campus of the University of Minnesota. Designed to meet the needs of adult learners and set in an educational atmosphere, your attendees can focus on their program free from distractions. We offer the latest technology, a full range of dining choices, and flexible room options with seating of up to 440 attendees including day, evening and weekend availability. University of Northwestern-Saint Paul is nestled on the shores of picturesque Lake Johanna in the heart of the Twin Cities. The 1500 seat performance hall, meetings rooms with state of the art technology, exquisitely decorated banquet hall, elegant marble chapel, outstanding catering services provide the perfect atmosphere for our meeting or event. Recently renovated Reynolds Fields allows for exceptional outdoor possibilities with turf fields, expanded stadium and lights.